The Cashen River in Ballybunion, County Kerry. This shot shows fishermen at work, using a draft net. The Cashen river is home to salmon and trout, which is fished by boatmen and anglers. The boatmen use traditional small open boats rather like "Currachs". The draft net is a single piece of net attached to a rope with floats at one side, and a rope with lead weights at the other. The net is dragged across the river by the boat, anchored by one fisherman on the shore. The net is then pulled in to encircle the unlucky fish. BRIAN MARTIN MEMORIAL OPEN BEACH FISHING COMPETITION, held March 2012 on the beautiful 'Long Strand' Ballybunion. This unique image made front page of the Kerryman newspaper. The beautiful long strand with it's expanse of smooth sand bordering the sand dunes of Ballybunion Golf Club was the perfect setting. The main image taken by Hartney Photos Ballybunion. Ballybunion Fishing offers two choices in Ballybunion. 2 Sea angling or Beach Casting off the beaches you’re sure in for a day’s treat. There are several places for fishing and beach casting in Ballybunion. The long strand is a great place to start. With two miles of golden sand beach to choose from the location makes a difference. Just below kitty's river that flows from the golf club it always a great spot for the Sea Bass. Working with the Lug Worm or the sand eel as your bait your sure going to have some fun. A lot of the local restaurants would gladly take your freshly caught fish and cook them as part of your dinner for the group that evening. What a way to spend some quality time with your friends at Ballybunion. Lugworm are large marine worms that live in U shaped burrows in the sand or sand and mud mixes. You rarely find them in the shingle, broken shell or other locations where ragworm are sought, but you will find some ragworm in lugworm beds. You may also find other baits such as clams and even the odd shrimp left behind by the tide. Lugworms' presence on a beach or mudflat is given away by the piles or 'squiggles' of sand deposited above the burrows. The more squiggles, the more worms there are in the target beach/area. The common "blow" lugworm typically grow to 8 inches long (20 cms) and the larger worms are found in the richer marine habitats and farther down the beach... Black lugworm - the preferred lugworm bait - is only collectable at low water and in some locations only on spring tides, when the water is farthest from the shore. Blow lugworm have very soft bodies, with a hard "tail" that is filled with this sand. Black lugworm are bigger and tougher hence the angler's preference for using them. I have only come to using sandeels recently myself with the arrival of packets of frozen sandeels (three inches long - 8cms) in the local angling shop in Listowel. Finding fresh sandeel in the west of Ireland is like finding gold at the end of a rainbow... and the frozen packaged sandeels are not cheap. There are two species here and the Greater Sandeel can reach a foot in length (30 cms) and swim with shoaling mackerel or garfish. Most sandeels however are smaller, almost impossible to catch by hand with a vingler without years of practice. Collection: If you do fancy a go catching them yourself, they do bury themselves in sand, often in estuaries and typically they are only around at low water. You will need a lidded bucket with water in it, and ideally a blunt thin bill hook called a vingler. A very keen eye and lightning fast reactions will help you a deal! The idea (!) is that you trap the sandeel in the blunt "eye" of the vingler with one of your fingers, often gloved. It works, honest! 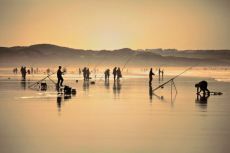 If you planning a Fishing trip then why not Ballybunion and take advantage of both River Fishing to Open Beach Casting. Special offers available to all Fishing trips booked in advance, including Local guides if required.